The block you'll be making is a sampler square called Susannah. There are four primary blocks marked Susannah A, Susannah B, Susannah C, and Susannah D. Each primary block is made up of four pieces. For fabrics, you'll need one background color and two primary colors, one dark and one light. For a printable version of the Susannah pattern, click here. NOTE: The finished square size is approximately four inches. Because of printer differences, you may have to enlarge or shrink the pattern pieces to retain this finished size. Print out the pattern and cut each primary block out. Be sure to cut on the outer set of lines as shown in the picture. This outer boundary marks the seam allowance for each block. Do NOT cut out the individual pieces inside each pattern block. Note: Recommended seam allowance for typical paper piecing is 1/4 inch. For small, detailed designs, the seam allowance can be dropped to 1/8 inch. 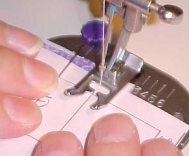 Set the stitch gauge of your sewing machine to the most stitches per inch possible. This ensures the small seams are caught and it perforates the paper as you sew, making it much easier to remove later. Most paper-pieced patterns require small amounts of alot of different colored fabrics. However, don't plan your fabric allotment too close because you'll end up wasting some as you sew. For the Susannah pattern, scrap pieces of at least 6" should be ample. Most paper pieced patterns have the primary blocks sequentially numbered indicating the order in which they should be sewn. For the Susannah pattern, the first block is Susannah A. 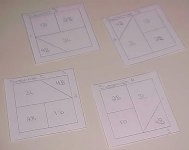 Each primary block has a number of pieces drawn out and labeled within the block. These labels identify the order in which the block is constructed and the color or fabric type of each pattern piece. In the case of the Susannah block, D is the dark fabric color, L is the light fabric color, and B is the background fabric color. The first piece is not sewn, but pinned in place. Find the first piece, marked by the lowest sequential numbering. For the Susannah A block, the first piece is 1D. Place the fabric under the block and cut a piece of the fabric large enough to amply cover the 1D area (be generous). Pin this first piece so that the back of the fabric is against the back of the paper. NOTE: During all stitching, if you flip the paper over, the front side of the fabric should be showing. 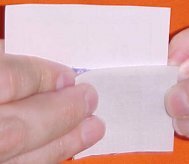 While you work on the front side of the paper, if you flip the paper over, you see the front side of the fabric. 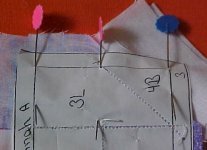 In paper-piecing, the pattern you sew is always the reverse of your finished piece. For example, if you're stitching a quilt that faces left on the paper pattern, the finished quilt will face right. Cut out your second piece to cover with seam allowance the 2B pattern space. Hold the pattern piece in the air facing you and lay the fabric behind so that the seam allowance is going into the 2B square. The right side of the fabric should be facing you and against the back of the paper. 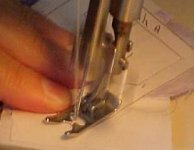 To sew the seam, place the pieces your holding into the machine with the pattern on the paper face up. Sew along the seam by starting just before the seam starts and ending just after the pattern does. This provides additional anchoring to the fabric. Flip the piece over and verify that the fabric covers the entire 2B area with seam allowance. Now flip the fabric back. Trim any extra fabric at the seam allowance (recommended seam allowance is 1/4", unless it's a very small intricate area then use 1/8"). Be careful not to cut the paper, only the extra fabric. NOTE: We recommend using flower pins (shown in the pictures). These pins have a flat head so they lie flat while you sew the pieces helping to discourage bubbles in the finished product. Flip the piece over again. Pull firmly against the seam so that there are no ripples in the fabric and then pin in place. Repeat these steps to finish the Susannah A pattern block, following the numerical sequence for the last two pieces. NOTE: When cutting fabric for diagonal or odd shaped areas, base your cutting on the widest point of the piece. Then with your fingers, line up the piece on the pattern to make sure it will fit. If you're not sure which way to add the extra fabric, cut a much larger piece and trim it down after pinning the sewn piece in place. Repeat these steps to finish the Susannah B, Susannah C, and Susannah D pattern blocks. Always build the blocks by following the numerical sequence given (in this case, from 1 to 4). When all blocks are completed, the last step is sewing the blocks together. 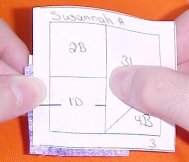 Most paper pieced patterns come with a construction diagram which shows the finished picture labeled with the location of each block. The blocks are usually constructed in alphabetical sequence (from A to the final block letter). In the case of our example block, there are four pattern blocks labeled A to D and installed in that order. The first two pattern blocks to be sewn together are Susannah A and Susannah B. Notice that the pattern blocks all have numbers around the outer border. The Number 1 sides of Susannah A and Susannah B mark the first seam in constructing the block. Match the number 1 of Susannah A to the Number 1 of Susannah B.
Pin each corner of the seam by lining up the seam and placing the pins into the corners. Line up and pin any inner seams. When securing the pin, hold the seam position firmly and bend the fabric to place the pin. If you just bend it with the pin, your seam will shift. When doing the final seams between constructed blocks, in places where the major seams need to be matched secondary seams should be going in opposite directions so it doesn't create too much bulk for the machine to sew through. 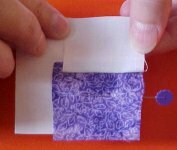 The more bulk the machine is required to sew through, the more likely the paper will shift so the seams are no longer aligned. 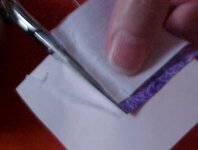 Sew along the seam from the edge of the paper to the edge of the paper taking pins out as you go. When you remove a pin, make sure you are firmly pressing the area just below the pin in place so that the seam will not shift when the pin is removed. When sewing down a previously sewn seam, remove only the under layer of paper. This helps reduce the bulk the machine has to sew through and it's a difficult piece of paper to remove later. Match the number 2 of Susannah C to the Number 2 of Susannah D. Pin and sew as instructed in the previous steps. 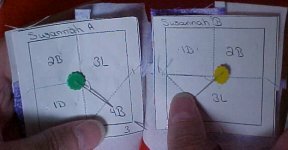 Then match the number 3 of the sewn Susannah A/B to the number 3 of the sewn Susannah C/D. Pin and sew as instructed in the previous steps. 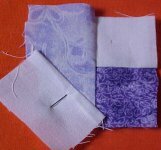 Cut off any extra fabric from around the square by cutting the fabric to match the edge of the paper. Note: This step is optional. You can leave the extra fabric around the block and trim it after you've sewn it to the next adjoining piece. The last step to any paper pieced project is to remove the paper. However don't be too hasty to remove it. The paper helps anchor your project piece together and provides a guideline for constructing the final pattern. 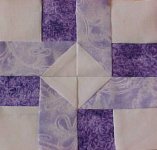 For example, if you're doing a project with multiple pattern blocks, like a quilt sampler of 6 inch blocks, do not remove the paper from the individual blocks until all are sewn together. Good practice is to not remove the paper until the quilt top is done. If you'd like to pursue further projects in paper piecing, check out our Recommended Books section or our Items for sale section for downloadable paper-piecing patterns.